Today, 24 March, is Patrick's birthday. He would have been 45 - he was 18 when he died in 1987. His friend wrote to me, and I had phone calls from Ali and my sister. Here's the piece from my book about his birthday. We placed his ashes under a pōhutukawa tree we planted in the Botanic Gardens, on a rise with a view over the city he knew and enjoyed so much. Although the tree is now so tall it’s hard to reach the lower branches, on Patrick’s birthday, on the day he died and on Christmas Eve I still reach up and leave a posy wedged there. One of his roses if they’re flowering, and a few forget-me-nots. Mock orange blossom, for the wedding he never had. Parsley, sage, rosemary, thyme. And a chocolate in the middle. 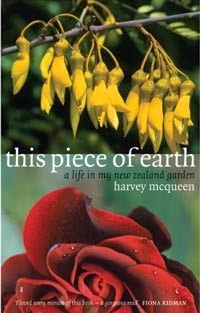 Of course I used to go with Harvey, but now I ask Lesley, the oldest friend I have in Wellington, to come with me. It helps when the sun is out, as it was this morning. The mock orange blossom has finished flowering. His rose, the original Remember Me, has died, and its replacement isn't doing at all well. So I took two other late roses, a red Dublin Bay for Harvey, and a creamy Jude the Obscure, as well as the herbs - and the chocolate.